Cedar, Tasmanian oak, kwila, fibreglass, epoxy. ​In many ways Porter is a work that is easy to understand. To look at it is to understand what it is and what it is made of. 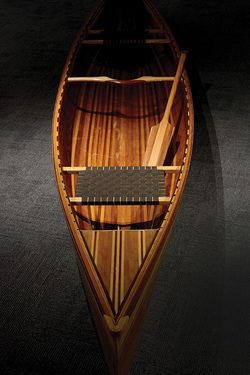 We can see in its material form the layers of the timber that have been rendered by hand and the simple, meticulous detail of the boat’s exposed joinery. Porter speaks to the heart of the making process. It demonstrates a commitment to time, and labour, to learning an applied skill situated within a craft tradition and trusting in an outcome that lies far ahead. On land Porter sits idle, an object imbued with potential of the water and the poetic and unknown nature of a journey yet to come. As an object, how might we understand The Beauty of Invisible Grief. A video plays of a traditional heir tiki form, rendered in ice and melting in real time adorning the body. Te Hira collected water from each of the three rivers of her whakapapa, casting it in this jewellery form; we hear a soft, sweet song momentarily, a calling by the artist to the land and location of her whanau, her ancestry that she is simultaneously distant from and connected to. The video plays on an immaculate and highly recognisable Mac screen – a symbol of contemporary culture, design and communication. 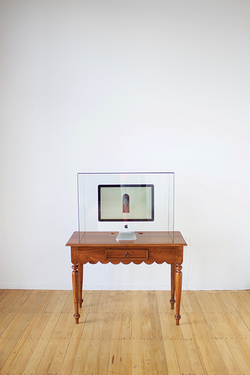 Te Hira encases the screen in a glass vitrine and ornate timber side table; these too are familiar, reminding us of colonial museological mechanisms for display in which Taonga and artefact are presented out of context, separated from the situation in which their meaning and significance were made. PO Box 599, Whakatāne, Bay of Plenty.